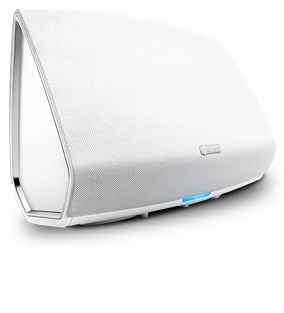 The Heos 5 from Denon is their mid range wireless speaker system and is ideal for medium sized rooms, such as bedrooms, offices, kitchens or medium sized living rooms. The unit is compact but boasts a full-featured speaker system which plays cloud music, music stored on your phone or tablet, plus USB and NAS sources offering a comprehensive range of connectivity options. The Heos 5 also features four full range drivers, one radiator and four state of the art class D amplifiers all perfectly balanced to offer superior sound quality. All this controlled with Denons state of the art digital signal processor whose origins are from the recording studio. The Heos provides clear sound which has been extensively developed combining studio grade sound engineering. 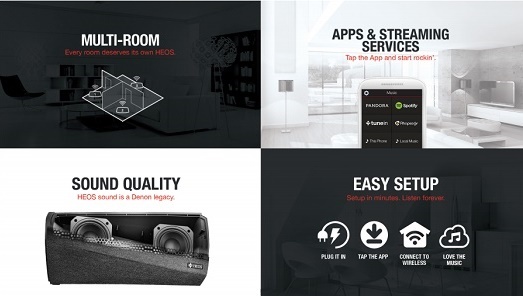 Controlling the Heos 5 is a breeze and cam be done via Denons free of charge app available for IOS and Android operating systems, speakers also have local volume control and mute buttons on board. The HEOS app lets customers choose from a range of popular subscription streaming services including Rhapsody, Pandora, Spotify and TuneIn, and from other services that offer DRM-free tracks. 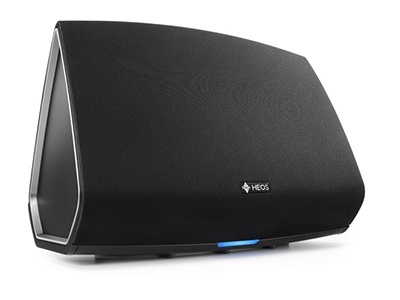 The HEOS 5 produces room-filling sound from its compact and stylish form factor. Enjoy streaming music from the cloud or local files using the intuitive HEOS app for iOS and Android. Within the stylish ported enclosure are dual Class D digital amplifiers and dual full range precision drivers. Sound is optimized via a suite of precision DSP acoustical processing algorithms that originated in the recording studio.